As a light scattering of raindrops from an early September thunderstorm fell over Arizona's Santa Rita Mountains, I spotted this Net-winged Beetle (Lycus fernandezi) feeding on Mule's Fat (Baccharis salicifolia) flowers while I was walking back to take shelter in my car. Luckily, the rain remained light, which allowed me to photograph this colorful beetle. Net-winged Beetles and other Lycus species are known for their generally red, orange, or yellow and black coloration, soft bodies, elongated mouthparts, widened pronotum (area behind the eyes) and broad, prominently ridged and veined elytra (orange and black wing covers). The bold, colorful markings of Net-winged Beetles and many of the other beetles in the Lycid Beetle family (Lycidae) are a form of aposematic coloration meant to warn potential predators that these beetles are extremely foul-tasting and may be toxic. 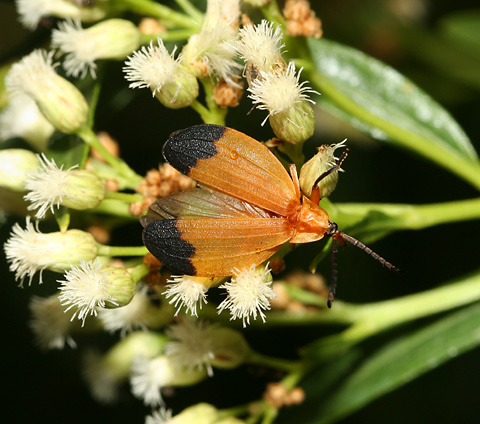 Other beetles and even some moths and other insects will mimic this distinctive orange and black Lycid coloration to avoid predation. Since we have several orange and black Lycus species here in Arizona, I wasn't sure which one this was, but entomologist Joseph Cicero, PhD kindly helped me identify it.